For busy actors, a new job often requires relocating to a new home. That was exactly the case for Jamie Chung when she took the role of Blink on FOX series The Gifted, which films in Atlanta, Georgia. 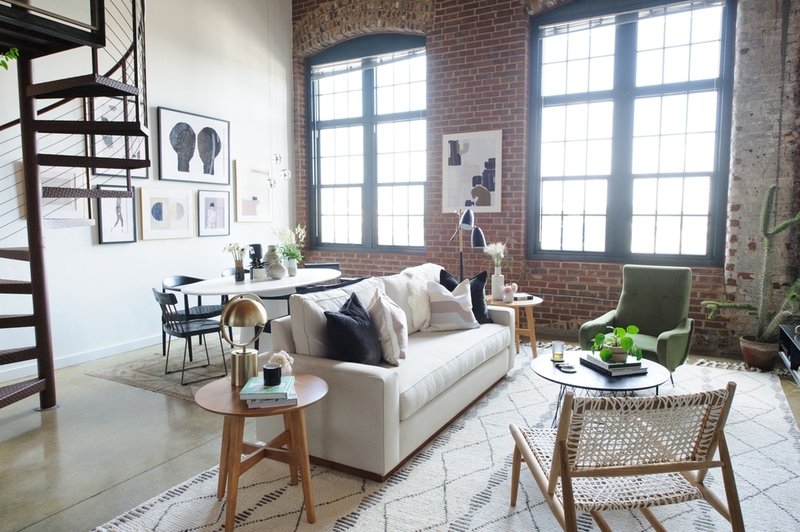 Jamie and her husband, actor Bryan Greenberg, bought a stunning loft in the vibrant Midtown district that’s close to everything the city has to offer—and gives her a quick commute to the set. After such success with their previous Decorist design projects in their LA home, a gorgeous mid-century bungalow living room and a vinatge-inspired kitchen remodel, they came back to us for more! 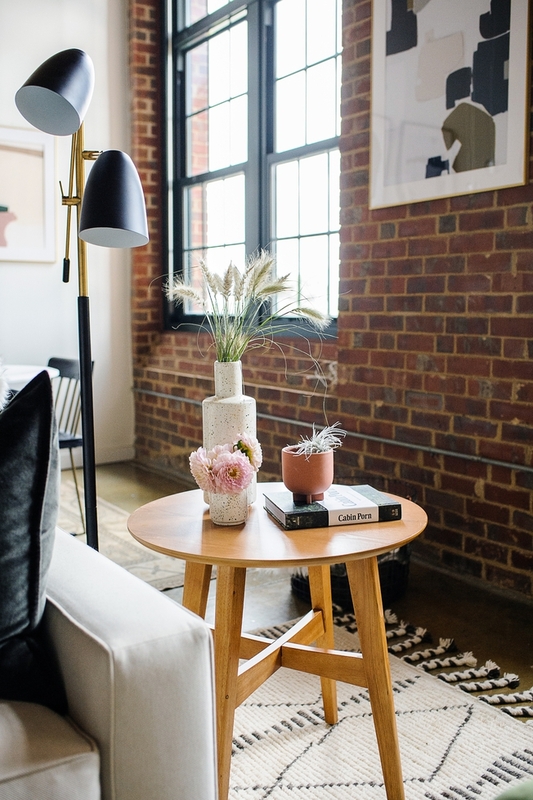 While their Atlanta condo had plenty of character, thanks to its location in a converted historic cotton mill, Jamie wanted to tone down the more industrial influences to truly make it feel like home. 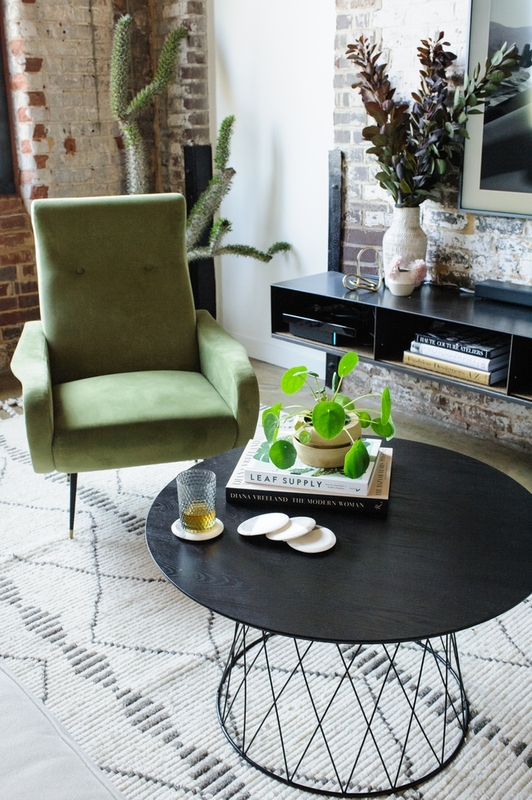 Since her busy filming schedule left little time for a redesign, Jamie called upon Decorist Creative Director Jessica McCarthy to bring her vision to life. Jessica beautifully interpreted Jamie’s personal style with furniture finds from Bed Bath & Beyond, along with artwork from Artfully Walls. The result? A comfortable, chic environment that’s the perfect place to unwind after a long day. Read on to see the full transformation and the inspirations that guided each step of the makeover. And through tomorrow save 60% on a Classic or Elite design service with promo code JAMIECHUNG — that's just $299 $119/room for a Classic design or $599 $239/room for an Elite design! 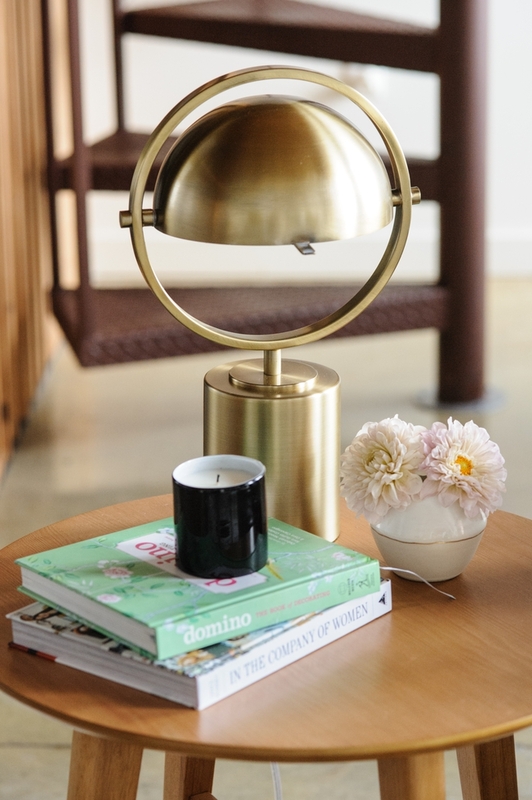 Jamie wanted her home to have a little bit of West Coast charm, as well as a cozy atmosphere. Instead of incorporating popular Los Angeles trends like boho and surf-inspired décor, Jessica translated the vibe of the region with color. “Jamie wanted a refined look for her living room and dining area that embodied that chic California feel with warm neutrals, gray, blush, and olive green, with enough seating for entertaining and throwing parties,” she said. The extensive product selection at Bed Bath & Beyond meant that Jessica had plenty of options for finding furniture in just the right hues. She anchored the living room with a white sofa that had subtle gray undertones and a warm pecan base that coordinating with the wood side table and leather accent chair. The ivory rug defines the seating area while adding pattern. The overall neutral palette did allow room for a statement piece: A deep green chair in a rich velvet upholstery. Jessica also chose a metal coffee table that complemented the metal legs of the chair and the room's vintage industrial interior architecture. Illuminating a large interior can be a challenge: If it’s too bright, the space feels cavernous and cold. The solution? Focused lighting instead of overhead fixtures. The light from a table lamp makes a large space like Jamie’s loft feel a bit more intimate. Elsewhere in the living room, the light from a floor lamp creates the same effect. Since Jamie and her husband frequently entertain, Jessica incorporated a versatile console into the design. Its surface has plenty of room for cocktail essentials and small appetizers. 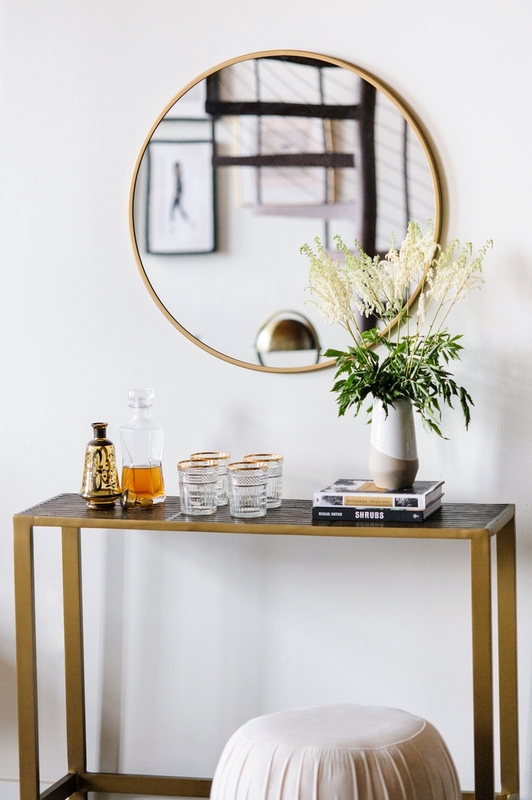 She added a large mirror over the console to help reflect light—and it also comes in handy for doing one last outfit check before guests arrive. Jessica rose to the task of creating two living spaces within the open-concept loft by giving each area a distinctive look. A sleek pedestal table makes a modern counter to the refined living room. 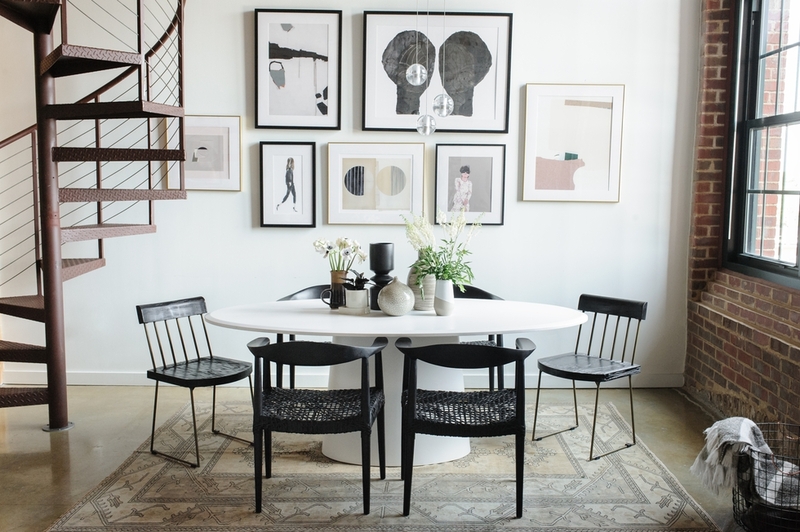 Black side chairs and end chairs stand out against the crisp white of the table. 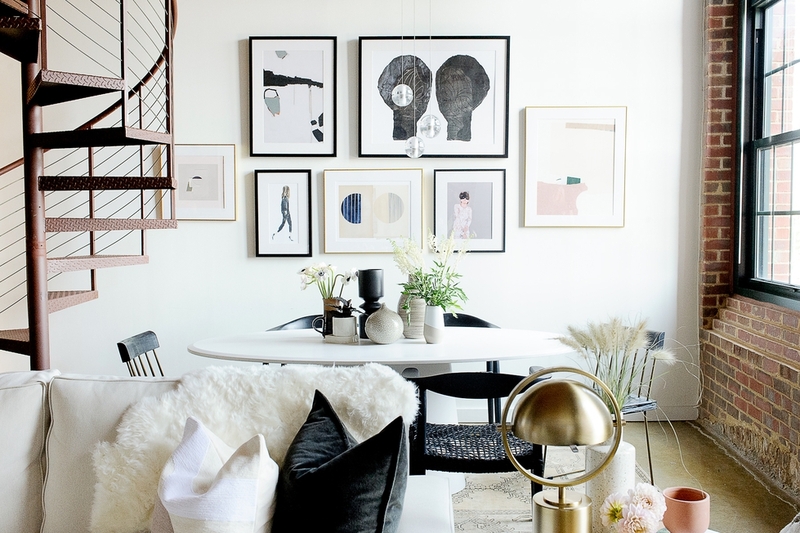 Grouping an array of smaller artworks gives them a more “massive” effect that’s perfect for the large walls in Jamie’s loft. Jessica chose a few abstract and figural pieces from Artfully Walls that brought a dynamic element to the wall. To unify them, she opted for slim frames in black and gold. Feeling inspired by Jamie’s makeover? Start a Decorist design service today to affordably transform your home into a refined retreat that suits your unique style. Through Jan. 23, save 60% on a Classic or Elite design service with promo code JAMIECHUNG—that's just $299 $119/room for a Classic design or $599 $239/room for an Elite design!